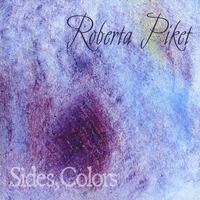 Anyone who’s ever been in the same room with pianist / singer / composer Roberta Piket and drummer / percussionist / composer Billy Mintz would sense the deep emotional connection between them — a good thing, since they are married, quite happily. But the connection is also musical. I’ve seen it in performances in the last two years, and their 2011 CD, SIDES, COLORS, is deep proof of how well-suited they are for each other, and for us. Wisely, this CD is structured as a traditional vinyl record was — two sides with six songs apiece. And although the listener doesn’t have to get up and flip the disc, the sense of two complementary musical worlds is strong. The disc begins sweetly and serenely with Roberta gently presenting the melody of Bill Evans’ LAURIE for us. Soon, bass (eloquently played by Johannes Weidenmueller) and quiet drums join in — but a surprise awaits as with the gentle stirrings of a string quartet and several purring horns. (Real musicians, I might add — not conjured up on a synthesizer keyboard.) Is it jazz, or modern classical, Third Stream, or evocative dance music? I gave up wondering about categories early on in the CD and simply allowed myself to be swept along by the shadings and timbres. Billy’s brushes — quietly symphonic — bring on the Broadway standard MAKE SOMEONE HAPPY, then Roberta adds her single-note piano lines. (I was already happy, mind you.) Clear, contemporary music, harmonically sophisticated, but firmly rooted in Basie, Pettiford, Jo Jones. And it subtly builds — not just in volume, but in densities, as the three lines intertwine, before settling back down to earth in a taciturn yet swinging final chorus, with a few witty small dissonances in — like spices — to remind us that we are in the land of surprises. Roberta begins BILLY’S BALLAD in the most pensive way — letting the music speak its piece in its own time — a most leisurely yet searching exploration. Then, a pause, and she begins the theme again, but with the most tender support and counterpoint from the string and horn ensemble. I didn’t think, “Oh, this is jazz-piano-with-strings”; rather, I thought of Dvorak — deep yet translucent beauty. Roberta is responsible for all the string and horn arrangements — but this one, wine-rich, is Billy’s. MY FRIENDS AND NEIGHBORS (dedicated to Sam Rivers) opens with dark woody sounds from Johannes . . . and then the gorgeous strings come on. Neither sentimental nor abrasive, carefully delineating the traditional melody but with edges and depths. Roberta’s solo improvisation follows; Billy adds his own voices as the piano’s exploration goes onwards . . . with strings and horns making what had been simple lines multi-dimensional, powerful, assertive, no longer serene. But the performance has a compositional arc — coming back to a hymnlike reading of the melody for piano and strings after a dramatic climax in sound. The venerable IF I LOVED YOU — from CAROUSEL — is revealed to us from new angles; the tempo is elastic rather than held down by the waltz (as Billy’s brushes make their own quiet patterns behind Roberta’s reverent melody and revamped harmonies). What was reverent becomes more free, even abstract, as the horns add their own commentary and Roberta brings her pure, focused voice to the lyrics — honoring the intent of the lyrics while elongating and recomposing phrases. She is at once girlish and adventurous: a model improvising singer . . . then taking fragments of melody and holding them to the light. Tapping cymbals and stern piano chords begin EMPTY HOUSE. A pause, then the horns outline a melody line, as if delineating a space through serious strokes of a brush, before Roberta joins them. I sense that this is a meditation on two minor chords, but the spare material never seems thin. And the four-and-a-half minutes is over too soon. The imagined SIDE TWO begins with Billy’s SHMEAR — the emotional opposite of the pensive, spacious EMPTY HOUSE. Not simply the musical evocation of an area of cream cheese, it vacillates between a nearly violent piano trio and a meditative piano solo passage . . . with the roles switching around among the three players. Quiet gives way to conversation and back to quiet again. Billy’s RELENT changes the timbre of the trio — with Roberta exploring on organ over rapid-fire lines from Billy and Johannes. UGLY BEAUTIFUL (again by Billy) returns to piano – string bass – drums, with improvisations that work off the song’s stark contours. And the CD closes with Roberta’s DEGREE ABSOLUTE — her evocation of the famed television series THE PRISONER, where escape is impossible and rebellion thwarted — but, happily, the music isn’t as bleak as the inspiration for it. In fact, the serene solo that begins the final track leads us back to LAURIE, which is another testimony to SIDES, COLORS being a work larger than the individual tracks. Here let me credit the musicians by name — besides Roberta and Billy and bassist Johannes Weidenmueller; string players Fung Chern Hwei, Mikyung Kim, Charisa Rouse, Jeremy Harman; horn / reed players David Smith, Charles Pillow, Anders Bostrom, Sam Sadigursky. The cover art is by Billy; graphic design by Roberta — and the whole effort is beautifully recorded by Michael Marciano. Rather than being formulaic — solos / head / solos or some variation, or “free-form,” this CD is exemplary in its compositional intelligence. The music never seems “written down,” yet each performance has its own larger shape — one that relates to the other compositions. And the music is given many chances to breathe. Hear, for example, the pauses on EMPTY HOUSE — music for a film not yet completed, I think. The listener becomes part of the exploration, wondering, anticipating, delighting. 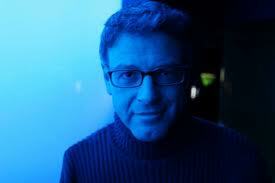 Michael Kanan is not only a superb pianist. He knows how to organize a jazz performance. And he has the finest friends I could imagine. I first came to hear Michael when he played two nights at the end of June with the brilliant saxophonist Joel Press: musical events one can find on JAZZ LIVES. Michael was and is a melodic player with a fine rhythmic surge, creating lines that move into spaces and places I didn’t expect: not esoteric or counterintuitive, but original. So when Michael mentioned that he was bringing three pianist friends — Tardo Hammer, Pete Malinverni, and Larry Ham — along with bassist Neal Miner and drummer Eliot Zigmund to the street-level Sofia’s (in the Hotel Edison, 221 West 46th Street) for a Saturday session of piano trios, I was extremely excited. With video camera, new Rode microphone, and tripod, I made myself as small as possible in the only available space, next to a mirror, which accounts for some interesting doubling-phenomena. Michael also did something simple and imaginative: rather than have lengthy sets for each of the players, each pianist played two songs in turn, then made way for the next person. It was wonderful to watch Tardo, Pete, and Michael intently absorb what Larry was playing — and if you switch the names around, you get a sense of the evening. I won’t comment at length on the players, except to say that I had heard Larry Ham as a member of Dan Block’s “Almost Modern” band, both live and on CD, as well as on a fascinating recital for the Arbors label. Tardo Hammer didn’t know me (which is understandable) but I had admired his LOOK STOP LISTEN (Sharp Nine) as well as his work with the Warren Vache-John Allred quintet. 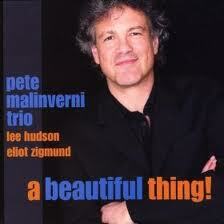 Pete Malinverni was someone new to me, which I regret, but his playing made a deep impression. Pete, incidentally, summed the evening up for me when we spoke at the end: “It’s melody, man!” Appropriately, many of the songs played that night harked back to the singers Bing Crosby, Frank Sinatra, and Billie Holiday. Aside from being a splendid videographer, Neal Miner is a resoundingly rewarding bassist — in many contexts — as well as a composer. And Eliot Zigmund showed himself a master of sounds: not simply sticks on the cymbals, but the many varieties of padding and urging that the wire brushes can afford. Mathematically-minded readers will notice that the division of four players and a dozen selections is not quite even: no disrespect meant, just a matter of room acoustics and the like. There were almost as many stellar performances that night that do not appear here. Those who find the occasional surges of conversation difficult to tolerate are asked to read my prior posting, A LITTLE SOFTER, PLEASE? I have refrained from commenting on individual performances, but a few words might be in order. Notice that all of these players have mastered the subtle arts of deep harmonic exploration while keeping that rhythm going. No Monk cliches, no tired Basie-isms, no cocktail piano rhapsodies. Yes, pianistically-allied readers can (if they like) Trace Influences and Chronicle Echoes, but I’d rather listen to the musical cathedrals these players build — in midtown, yet. Most of the songs deal — at least in their lyrics — with love. Found, lost, rejected, endured, celebrated. But the love celebrated here is not just romantic: these players not only love but embody the great spirit of creative improvisation. I can’t wait until Michael’s next piano effusion!